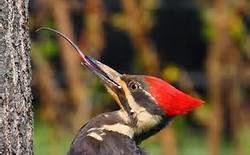 A woodpecker’s tongue is so long that it has to be kept coiled inside its head. By the title, you may be wondering what physical characteristics a woodpecker would have that leans itself to be called amazing. A bird is a bird, you say. However, as I watched a pileated woodpecker drilling on a dead tree, I found myself intrigued by it long beak and strange looking claws. Moreover, its action was, and is completely different from a robin or cardinal. My curiosity got the better of me, and lead me on a search to answer the following questions. · Why doesn’t a woodpecker get a headache with all his drumming and drilling? · How does he support himself while drilling into a tree without falling off? · How does he gets his food out of a tree, and if it is a Northern Flicker, out of an anthill? · Why doesn't a woodpecker get wood dust and particles in their eyes, like humans? · Why does he drum against a tree, a deck or roof? The tongue varies according to the woodpecker's diet and mode of foraging. Woodpeckers that excavate deeply into timber, such as the Pileated, have shorter tongues with spear-like tips bearing backward-facing barbs. Woodpeckers foraging mainly on the ground, such as the Northern Flicker, have tongues with flattened tips. Sapsuckers have brush-like tongues that hold the sap of trees by capillary action. Species that feed from crevices and surfaces of trees usually have longer tongues with bristles concentrated at the tip. Most songbirds have three forward-facing toes and one backward-facing toe. Most woodpeckers, however, have two toes facing forward and one facing back. This is known as a zygodactyl foot and allows woodpeckers to easily climb and grasp trees and other structures. Woodpeckers move up a tree by hopping and depend on their especially stiff tail feathers to serve as a prop. They work their way up a tree, peering and poking into every nook and cranny, and then either fly in an undulating fashion to a new area or glide down to a neighboring tree to begin their foraging anew. First they have a sturdy bill, for pounding holes in the wood, or for chipping pieces of bark out of the way. It needs to be sturdy – the bird’s bill may be traveling at 25 miles per hour when it hits the tree! Woodpeckershave special shock absorbers in their skull to avoid being knocked unconscious by such a force.